Ring News 24Boxing News Breaking Boxing NewsAmir Khan vs. Phil Lo Greco Erupts in Liverpool; is this what Amir needed? If there is every a boxing personality who can draw the masses despite some misfortunes in and out of the ring, former world champion and British star Amir Khan comes to mind. Khan, now 31 years old, returns to the boxing ring on April 21 when he faces off with brash Canadian Phil Lo Greco inside of the Echo Arena in Liverpool. The former world champion has been on a big stretch of inactivity, as his last match was his sixth round knockout loss to Saul ‘Canelo’ Alvarez in May of 2016 inside of the T-Mobile Arena in Las Vegas, Nevada. Khan was stopped brutally by Alvarez in a catch-weight clash at 155 pounds but will now be returning to the welterweight division when he faces off with Lo Greco. Lo Greco is a tough-minded guy, but limited a bit with his ability. His unanimous decision loss to Shawn Porter and third round TKO defeat to Errol Spence Jr. proved as much. But when it comes to pre-fight banter, Lo Greco is no slouch, as he has said several disparaging things about Khan leading up to the fight. Both men were on hand inside of the Hilton Hotel in Liverpool, England to formally announce their April 21 fight. After trading some insults with one another, as is the custom, Lo Greco made some comments about Khan’s often-publicized public marital dispute which led to an eruption from Amir, who ended up throwing some water at Lo Greco, as the two men had to later be separated. Speaking to SkySports.com recently, Lo Greco shed light into him and Amir’s rocky dispute. “What happened was, I have a TV show called the‘Culinary Fighter’. I tagged him in one of my episodes because I called him a ‘Khandashian’. I tagged him and he blocked me. I didn’t think much of it. I’m like whatever, he took it personally, and then when he announced the fight, I called my producer and said hey man, do me a favour, knock up some photos, let’s just have some fun,” said Lo Greco. ”But I didn’t think he was going to bite. 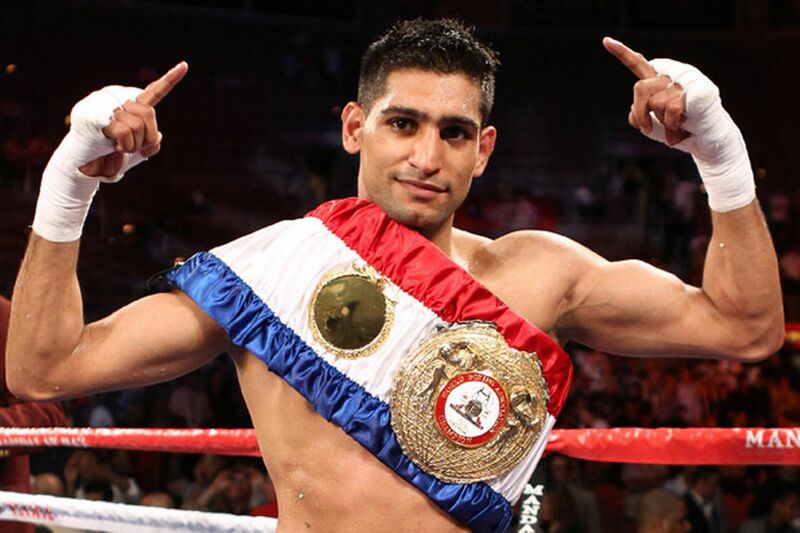 Eddie Hearn, you hired a client named Amir Khan. What does that tell you? Your client is mentally weak,” the Canadian brawler added. Speaking further on the Canelo fight, Lo Greco believes that the loss is one of the reasons why Khan is no doubting himself, as he knows Amir is likely looking at him as some kind of soft touch in hopes of landing a bigger fight. Lo Greco is banking on Khan’s previous chin issues to arise again. Either way you spell it, things are looking to heat up for April 21.